To those who can decipher it, the night sky is alive with gods and goddesses, animals and mythical creatures—an endless carnival played out in shining constellations. Amidst this jet-black canvas pricked with white dots, a hunter leaps in pursuit with his dogs at his heels, a sea monster threatens a maiden in distress, and a pair of twins lives forever. 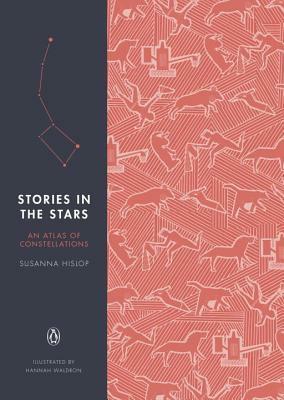 In Stories in the Stars, writer and stargazer Susanna Hislop and international artist Hannah Waldron present an imaginative journey through the heavens. Leaping between centuries, cultures, and traditions, they explore each of the night sky’s eighty-eight constellations through gorgeous illustrations and vivid descriptions that will linger in readers’ minds long after they’ve closed the book and stepped outside on a starry night. Susanna Hislop is an actor, writer, and theater maker. She is artistic director of Slip of Steel theater company and a contributing editor of the Junket. She has also worked as a freelance journalist and writer for publications including the Sunday Times (London), the Evening Standard (London), and the Telegraph (U.K.), and has coauthored a Connell Guide on Mrs. Dalloway with John Sutherland. Hannah Waldron is an artist and designer based between London and Stockholm. Her graphic and narrative-led image making has been applied across a range of media, from print to textiles, at both a personal and an architectural scale.